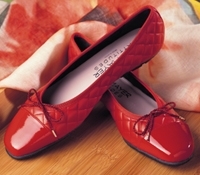 Spanish made patent leather tip tortoise toe quilted leather flats in A-black; and B-beige. Shoes available in a full range of sizes, as well as an adjustable band around the top of the shoe for a customized fit. Available in 6.5-10 in half size increments.